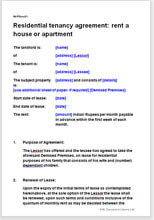 This lease agreement covers residential premises. Though designed primarily to protect the interests of the Landlord, both sides can have a fair deal. Compliance with Rent regulations is a complicated exercise. You need to be extra cautious. Hence use only Net Lawman documents for compliance. One of those detailed Lease Agreements that covers all the possible eventualities that may arise in the landlord-tenant relationship essentially to avoid litigation at a later stage. Any one wanting to let out premises or taking one on lease for residential use.